Are your staff as healthy as they think? With more organisations rolling out health and well being programmes, today’s staff might be inclined to think they are getting healthier – but are they really as healthy as they think? 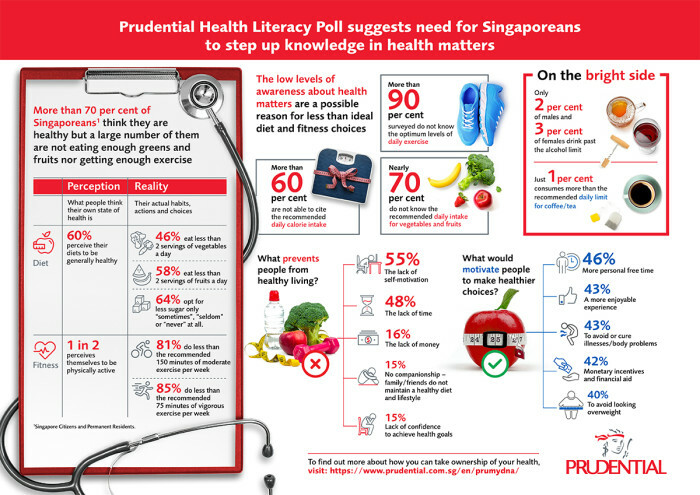 According to Prudential Singapore’s Health Literacy Poll, while more than 70% of Singaporeans think they are healthy, many are not eating enough greens and fruits nor getting enough exercise. 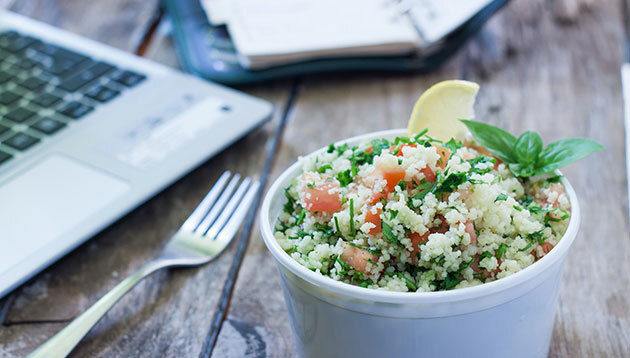 In terms of eating healthily, while 60% of the 501 respondents perceived their diets to be generally healthy, close to half of them (46%) eat less than two servings of vegetables a day, the recommended portion by Singapore’s Health Promotion Board. At the same time, about three in five also consume less than the prescribed two servings of fruits a day and almost two-thirds opt for less sugar only ‘sometimes’, ‘seldom’ or ‘never at all’. When it comes to exercise, about four in five (81%) do less than the recommended 150 minutes of moderate exercise per week and 85% do less than the recommended 75 minutes of vigorous exercise per week. On the bright side, only 2% of males and 3% of females drink past the alcohol limit, while just 1% consumes more than the recommended limit of four to five cups of coffee/tea a day. This is despite the fact that the majority of Singaporeans are ignorant about the recommended level of alcohol (95%) and coffee/tea consumption (97%). READ MORE: Are your employees facing health problems due to obesity? The survey pointed out that one of the reasons for Singaporeans’ less than ideal diet and fitness choices is the low level of awareness among Singaporeans about what constitutes healthy living. More than 90% of respondents are unaware of the optimum levels of daily exercise while nearly 70% do not know the recommended daily intake for vegetables and fruits, and 60% are not able to cite the recommended daily calorie intake. Apart from the knowledge gap, the top barriers that keep people from maintaining a healthy diet and fitness regime were a lack of self-motivation (55%) and time (48%). As for what would motivate Singaporeans to commit to healthier choices, unsurprisingly, having more personal free time (46%) was ranked as the top motivator. This was followed by having a more enjoyable experience of exercising and eating healthily (43%), and receiving monetary incentives and financial aid (42%). More than two in five (43%) also said that the prevention of negative outcomes such as illness or obesity would also drive them to make better choices. With 63% of candidates believing they don't need to be behind a desk to get work done, here are three tips for a flexible workplac.. Flexible working time accounts is a lesson Minister of State for Manpower Teo Ser Luck picked up on his study trip to Germany. ..
As a result of the leak at Chemical Industries (Far East), two emergency responders and five external persons were exposed to the ..